How to contact us For information about our services, prices or if you have any other requests, get in contact with us by email or telephone. We are always available to provide you with information about any type of our services. If you prefer you can send your requests via online booking. 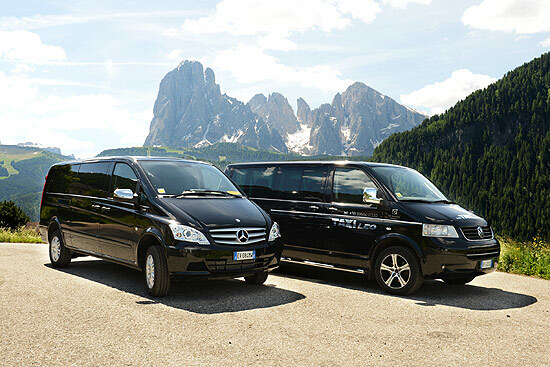 These services are available for you from the following airports: Malpensa, Linate, Verona, Bergamo, Venezia, Munich and many more in South Tyrol and all over Europe. We offer a comfortable and safe passenger taxi transportation with minibus (for 1 to 8 people). With us you get the best service. Our company Taxi Leo, transports passengers, focusing on these three aims: quality, comfort and safety. The base is in Ortisei. We are 24 hours available for you. The minibus (for 1 to 8 people) is equipped with the most modern electronic systems available on the market, in order to assure the best service, safety and the greatest comfort for our passengers. We wish you a good journey!